Do you like roms? I like roms. Have a rom. 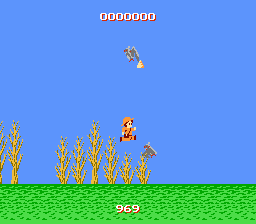 It’s Activision’s unreleased Super Pitfall II. 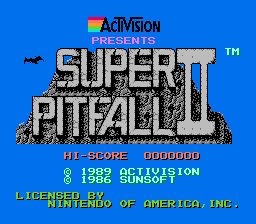 Super Pitfall II was a planned localization of Atlantis no Nazo, a Sunsoft-developed platformer that, thankfully, is completely unrelated to the original (and god-awful) Super Pitfall. Atlantis no Nazo is kind of awesome. It has terrible controls, and any expert playthrough you watch will be mostly inexplicable, but once you get a sense of how the game’s logic works, it’s actually a whole lot of fun to play. It’s also really weird and mysterious, which is what I love most about it. Atlantis no Nazo is full of hidden secrets, balance-breaking power-ups, and obscure warp zones. Some of the game’s biggest secrets require you to commit suicide, explore outside of the screen’s borders, or chuck bombs at nondescript background tiles. It’s not for everyone, sure, but I like it a lot. The changes made to the unreleased North American version make the whole thing even more interesting.